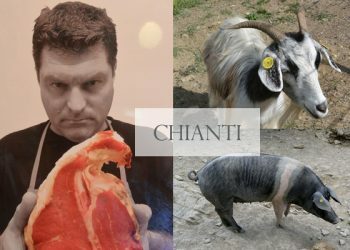 In just a couple of weeks, we will be leaving our beloved Umbria yet again to return to North America for the winter, so we decided to squeeze in one more trip between our olive harvest and closing up the property for the winter. If you follow my blog at all, you will probably notice a trend. We love seafood of every description, and with Umbria being one of the few landlocked regions in Italy, we tend to plan our trips away to the sea, where we can gorge on fresh seafood daily. 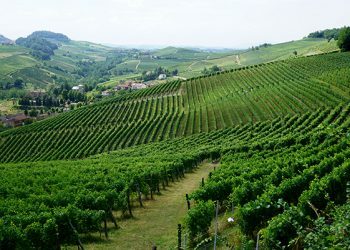 Although Umbria has my heart, if I were to choose another region in Italy to live in, I think it would have to be Puglia. The countryside in Puglia is ever changing, the people are exceptionally warm and friendly, and of course the region is surrounded by coastline which for us means unlimited seafood! Puglia is a fair distance from Umbria, so we planned to be away five days, and I booked accommodations in some of our favorite Pugliese towns, Vieste, Ostuni, Otranto, and Gallipoli, all towns along the coast. We’ve visited many of the interior towns on earlier trips to Puglia, but were more motivated by the lure of seafood this trip than visiting the sites. 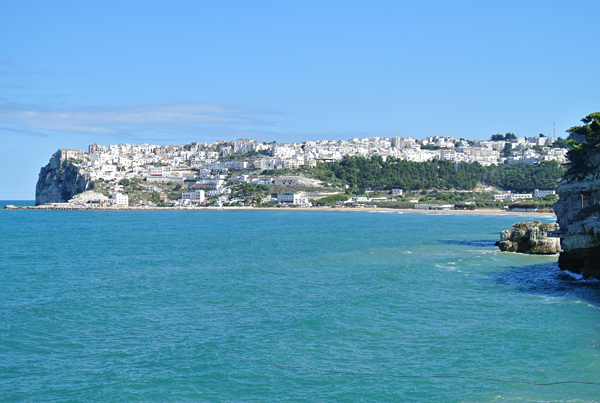 Vieste is on the Gargano Peninsula and is one of the most prominent towns along this section of coast due to its sandy beaches and history. The drive along the coastline around the peninsula is simply stunning, and one I would highly recommend to anyone visiting Puglia. 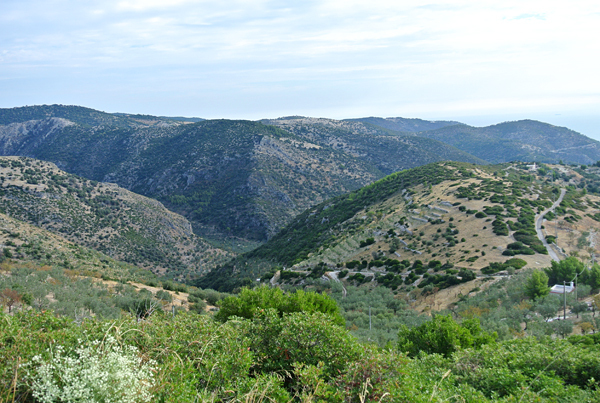 There are some sections of the drive where you pass through the Gargano National Park and the road is cut through the forest and tented with towering trees. It certainly is not unexpected to see goats, sheep, water buffalo, and horses walking along the road as you drive through. After our stay in Vieste, we were heading down to Ostuni, but broke up our trip with a stop in Polignano al mare, one of the coastal towns we’ve never visited. 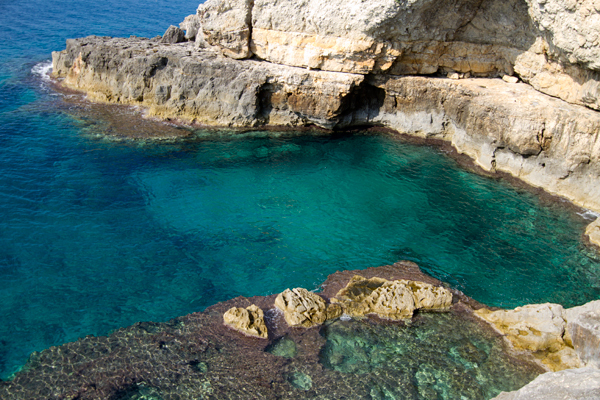 Polignano a Mare is in the province of Bari and its economy is mostly based on tourism, agriculture and fishing. The city seems to grow out of the rocky limestone cliffs on which the town is situated, which is truly an breathtaking view. After lunch in Polignano, we headed to Ostuni, our next stop on our trip. 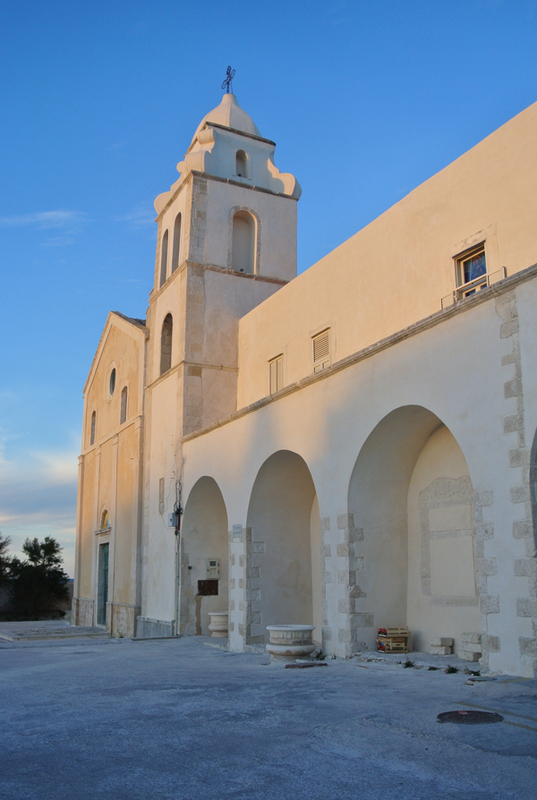 Ostuni, known as one of Puglia’s “white towns” has always been a favorite destination of ours since we spent a week with family living in a truli just outside the town a few years back. Unfortunately, almost every time we visit Ostuni it is pouring rain and this visit was no exception. Though always a beautiful town, walking around exploring in torrential rain is not all that enjoyable, so we’ll just have to go back soon when we can enjoy Ostuni more. 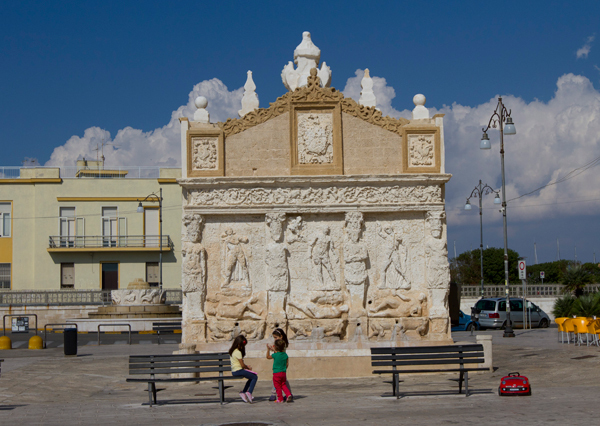 Otranto was the next stop on our trip and is yet another white washed town along the coast of Puglia, with a rich heritage of Greek, Roman and Biyzantine occupation all apparent in the architecture. 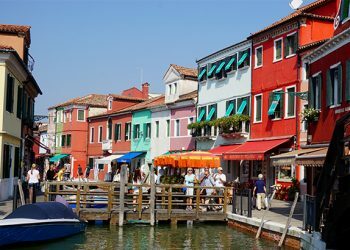 The town is however a tremendously popular tourist destination, and even mid October there were many tourists visiting. We had one of our best meals here in Otranto at a small trattoria called L’altro Baffo. The meal was quite unique with a contemporary twist on seafood and amazingly delicious! Very appealing to me personally, was that the chef and kitchen staff were all female, while the servers were all male. The restaurant is situated across from an elementary school that held a concert the night we were there, and we had a lovely evening dining outside being serenaded by Pugliese folk songs. 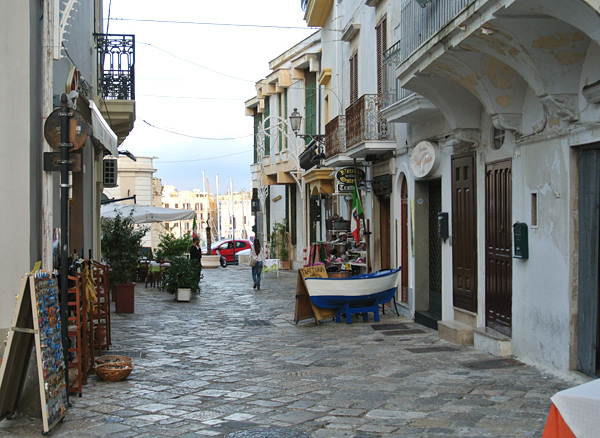 Our final stop in Puglia was to Gallipoli, one of my favorite Pugliese towns. There is a decidedly different feel to this town that merges the old historical center and marina with a very vibrant, bustling younger section of town. After wandering through town, we headed down to the docks to watch the fishing boats come in. Many folks crowd the docks waiting to see what is on offer, and after separating the seafood that is reserved for local restaurants, the fishermen pull crates of seafood off the boats and sell it right on the dock. The fishermen and townsfolk alike were tasting the raw shrimps and squid while bartering over price. It was quite amusing to watch the older women check out the offerings of each boat, then try some tough bargaining, before moving on to the next boat to start all again. When in Gallipoli we always stop for pizza at Pizza New Style Capri where Massimiliano Stamerra, award winning pizzaiola, preforms magic throwing his dough. A visit to Puglia would not be complete without a mention of the amazing olive trees growing throughout the region that are hundreds if not thousands of years old. Having 100 of our own olive trees we will soon be harvesting, I’ve learned to love all things olives and took dozens of photographs of some of the wonderful olive trees we spied along our drive through Puglia, and I couldn’t resist getting out and hugging one of the wonderful trees I took photos of. Although we had planned to stop overnight on our way home since it was almost an eight hour drive from Gallipoli to Umbria, after stopping for lunch in Termoli, yet another beautiful coastal town but one in Molise, we decided to drive straight through and sleep in our own bed instead which was extremely gratifying indeed after four nights away. We had a wonderful break away and certainly had our fill of seafood, but although it is always nice to get away and visit somewhere new, it is even better to return home again, which helps you appreciate your daily life even more than usual. 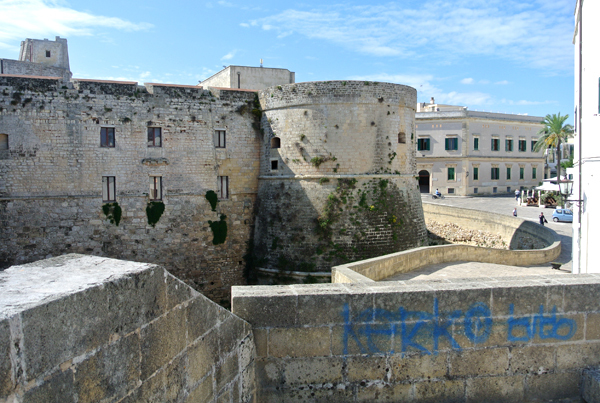 Read Also – Our Previous Visit To Puglia in 2010! Peshici, Puglia as seen from our lunch table. 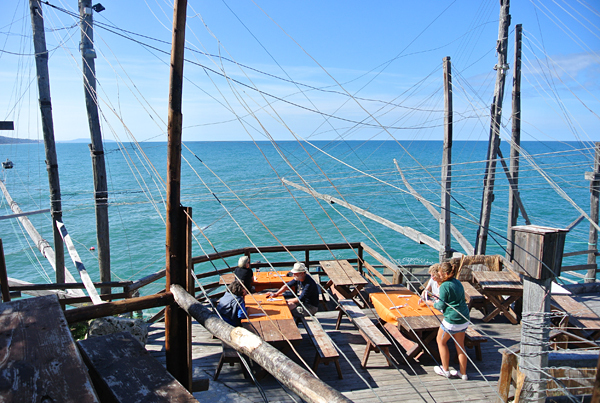 Our lunch at Trattoria Trabucco, built amongst antique fishing stations. 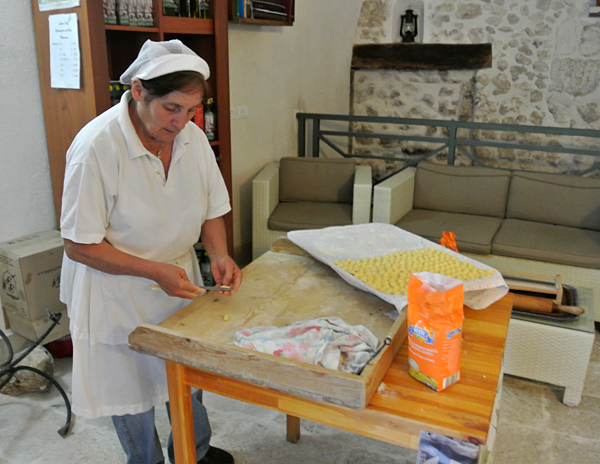 Nonna making handmade orecchiette. It was so good looking we ate dinner there! 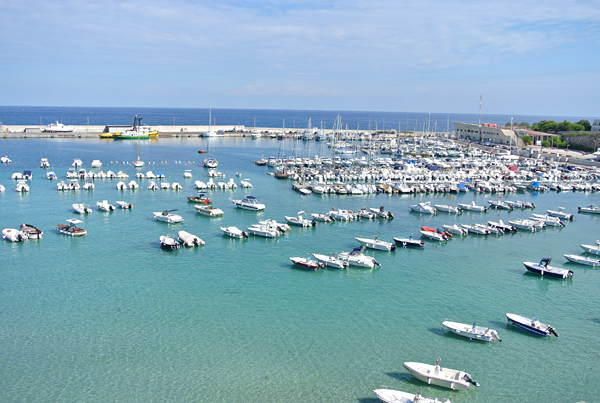 Clear blue waters at Otranto marina. 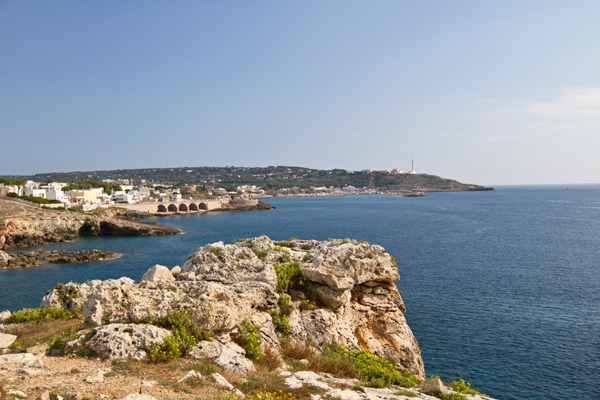 Coast of Puglia viewed from the southern most tip of the region. Grotto next to the southern most tip with sparkling clear water! Have you hugged your olive tree today? Wish I could have brought this one home with me. AMAZING! Considered to be one of the oldest fountains in Italy possibly gets its name from the Greeks. 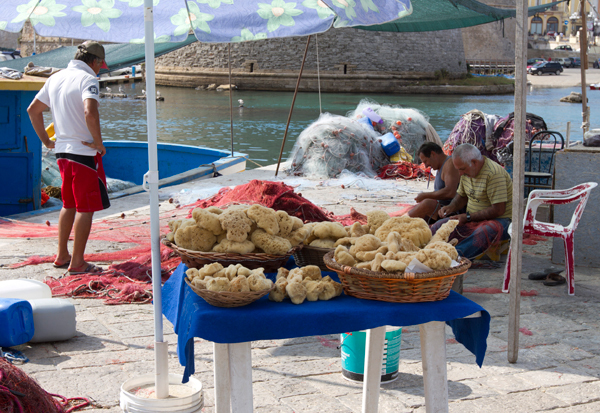 Fisherman in for the afternoon repairing their nets and selling sea sponges. 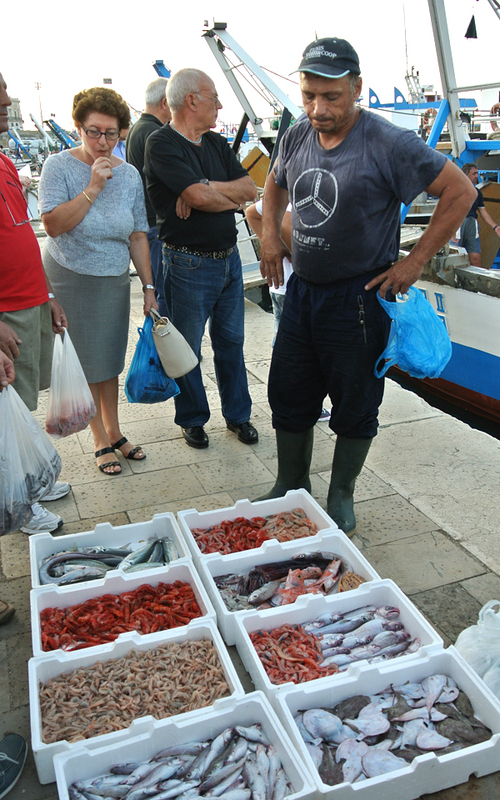 Just some of the fresh seafood sold on the docks at Gallipoli each evening. 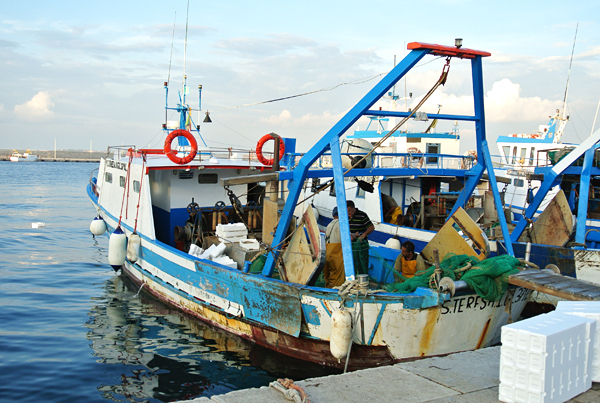 One of many of the old fishing boats having just arrived at the dock with the catch of the day. 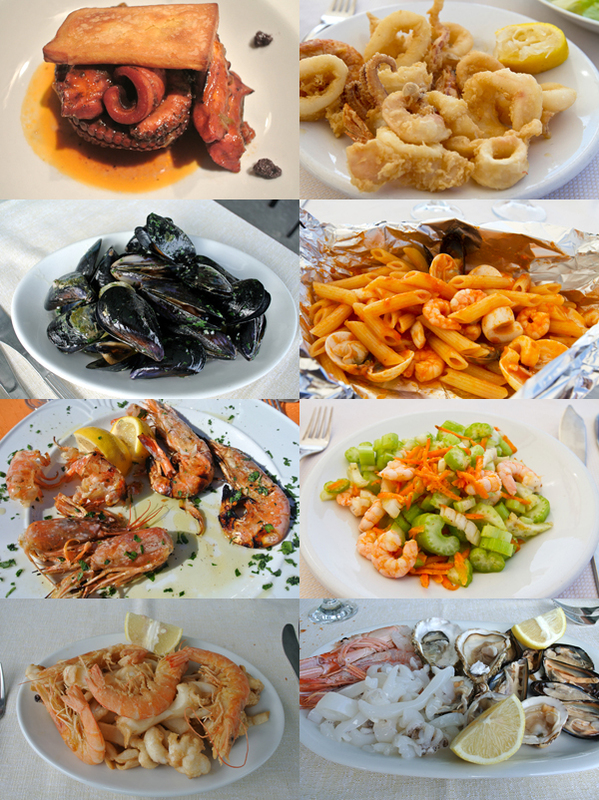 Just a few of the wonderful dishes we enjoyed in Puglia! Thanks for the last trip of the season to Puglia and the great photos. Made me want to head over to the dock and then to the kitchen to make orecchiette. It looks absolutely beautiful! You are blessed to be able to enjoy it. Wow! Making me so jealous again. Beautiful pictures. Thanks so much. Thank you, Deborah, for allowing all of us to live in Italy through your wonderful pictures and writings. Have you learned to speak more Italian since we saw you 2 years ago? I am still trying to become more fluent. 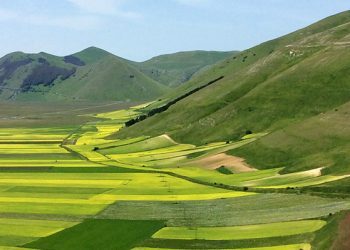 Stay well and enjoy the last few days in Umbria. 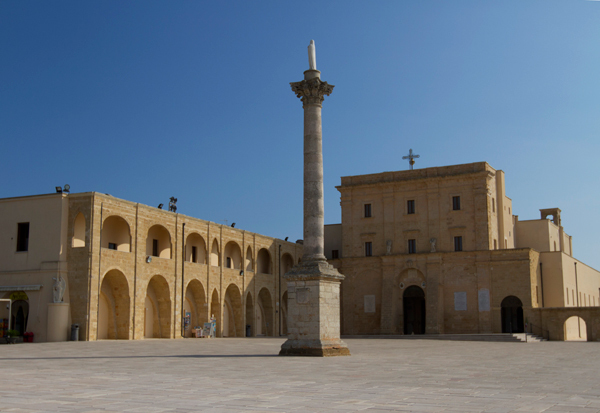 Thanks for this terrific entry on Puglia. 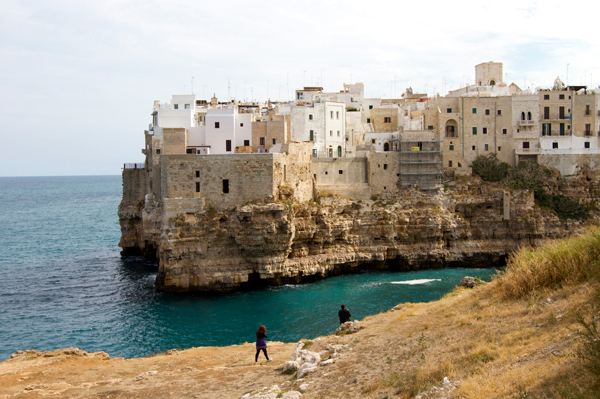 I’m currently planning a trip to Italy (my sixth) for October 2013 and Puglia has been on my list for a while. Your expose has solidified for me that I need to go!! What a fabulous trip! Puglia is beautiful! Wonderful photos! Thanks so much for the lovely site Deborah. I have only recently found it and am so glad I did. I love wandering my way around it! 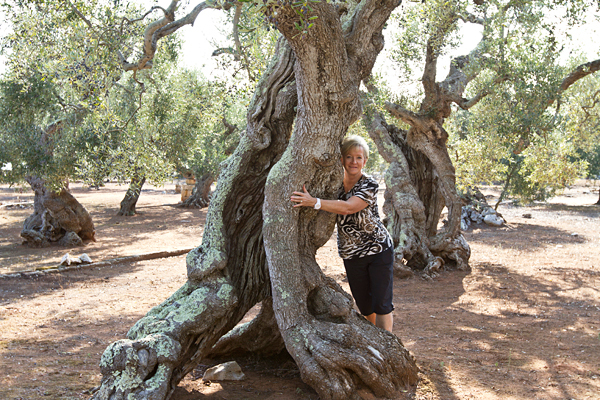 It was so nice to see the picture of you hugging the olive tree! Now I have a better idea of who is writing all these super recipes! Thanks for stopping by IFF Elaine! How very Lovely! What a fabulous trip. Thank You so much for sharing your blessed life and adventures with us, Deborah. If I’m ever able to make a trip to Italy, I’m coming here to IFF for notes beforehand! My dream would be to stay at your lovely farmhouse for a few weeks, enjoy your lovely food and take a few drives to explore what you’ve shared with us here. By the way…… I’m getting ready to prepare your pumpkin tiramisu today with fresh roasted pumpkin from the garden! Can’t wait! Our local grocery here in Montana doesn’t typically carry many of the ingredients I need for gourmet cooking, but I’ve been training them! They ordered some mascarpone and some lady fingers for me especially for this recipe. My neighbors anxiously await trying your tiramisu tonight! Hope you enjoy the tiramisu. 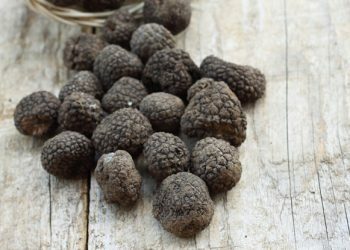 We’d love to see you here in Umbria! I came home yesterday from a wonderful trip with friends to Puglia and Abruzzi. I have so many photos of the food we enjoyed. Thanks. just spent a week riding my bicycle through Puglia and visited the same towns that you visited….without the rain! Riding through the countryside, seeing the thousands of olive trees, staying in masserias and dining on the finest seafood ever was just amazing. 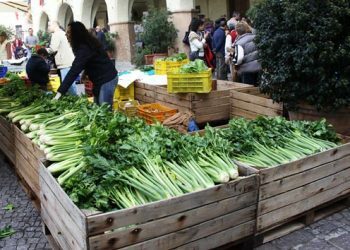 And who can forget the freshpicked produce and delicious primativo wine. thank you for these recipies and the photos…keeps my trip close to my heart and onto my table. Deborah, how you tease us with all these beautiful pictures!! You are so fortunate! Seeing all the beautiful places and the delicious looking food only convinces me more that I just have to get to my beloved Italy some day! Thank you so much for sharing with all of us! Thanks Joann, Italy truly is an amazing country. these photos took me back to my childhood, when my grandparents moved back to their home town in Manfredonia ( FG ) and we were also living in Italy. We’d visit on the weekends, and nonna would be making orecchiette, or homemade cannoli. Nonno, instead would leave in the morning to get to the fish market, and bring home some freshly caught fish or octopus! I was able to take my family back there 3 years ago, and we stayed in Vieste for a week. My children want to know why we don’t live there year round! Wonderful website, I am glad my friend turned me on to you! I, too, adore all kinds of seafood. This is one area I have yet to really explore. The turqoise sea, beaches, and ancient olive trees are gorgeous. Nice photos, tempting post! I shared this with my mother, siblings and all my cousins. My grandfather was an Ostuni! From your 2012 and 2014 trip description and photos, we have decided to go in 2015. When is the best time to travel? We would like to walk in your shoes, so kindly feel free to further recommend additional hotels, eateries and travel representatives to assist us in our plans.